Although it's still August, we've been having cooler weather here in Wisconsin. It's really got me feeling in the fall mood, as you can tell by this card! I really love summer, but fall is one of my favorite seasons of the year. There's nothing better than cool nights with bonfires, sweatshirts, and the changing leaves! 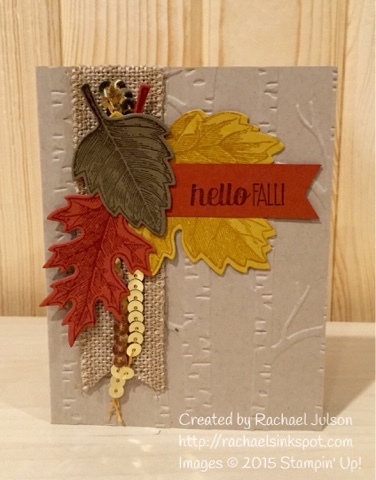 Speaking of leaves, the Vintage Leaves stamp set is one of my new favorites! It has a matching set of Framelits, so I can see myself using it for so many projects - cards, scrapbook pages, and gift packaging! Do you spy a new embossing folder? It's one of the amazing new products available in the Holiday catalog that starts September 1st. If you haven't gotten your copy yet, message me and I will get one to you!